Place setting of the calligraphed menu at a client's dinner party. Floral arrangements done by Wylde. Another place setting of my menu with a floral accent by Wylde. 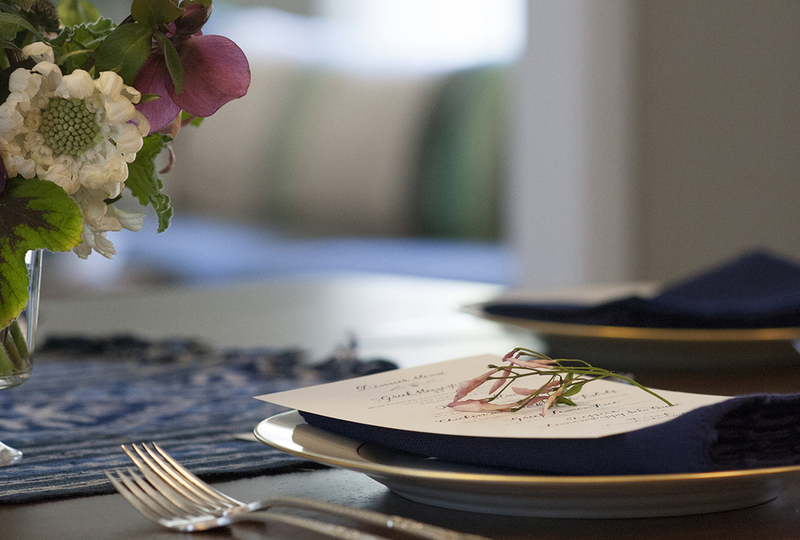 Detail of the calligraphed menu and place card for the dinner party. Raleigh, N.C. — I finished a commission of calligraphing menus and place cards for a client's Mediterranean-inspired dinner party. She sent me beautiful photographs of the pieces in situ at the dinner table. The hand-done menus and cards were greatly enhanced by Wylde's stunning floral accents and arrangements. Gag menu for my brother, one of the guests. Since my brother was one of the guests of the party, I made a gag menu for him. Having grown up watching a lot of movies from the 1980's, the menu contained references to Revenge of the Nerds (a salad made from jock straps dressed in liquid heat) and one of our personal favorites, Indiana Jones and the Temple of Doom (a boa with baby eels, broth of eyeballs, and chilled monkey's brain).